Review date: 2 June 2000. Let's not beat around the bush here. Logitech - who make Dexxa products - have clearly looked at Microsoft's "IntelliEye" series of mouses, with their glowing optical pickups, and said "we can do that". The idea's a groovy one. 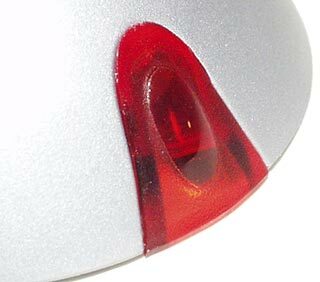 Instead of the cheap but frightfully primitive opto-mechanical design that most mouses use - rubber-coated ball turns little rollers, little rollers turn photo-interrupter wheels - the IntelliEye mouses use a tiny camera that looks at whatever's under the mouse. The camera takes pictures some 1500 times a second, compares the successive images, and from that figures out how you're moving the mouse. Optical mouses existed before this, but they had far simpler movement encoders that needed special patterned mousemats. With the new camera design - which needs an alarming amount of processing power built into the mouse - almost any surface with a bit of detail is sufficient. Plain desks, almost any mousemat, your leg, a wall; you name it. The Dexxa Optical Wheel Mouse looks like a hybrid of Microsoft's big, show-off IntelliMouse Explorer (reviewed here) and the sleeker IntelliMouse Optical (reviewed here). It's silvery and has a superfluous LED tail-light, like the Explorer, but it's symmetrical, like the Optical, so right- and left-handed users can handle it. And, like the two funkier Microsoft models, it's got two extra programmable buttons. With four buttons and a clickable "wheel doohickey", these mouses strike a balance between simple two button models and the ridiculous button-encrusted "Swiss Army Mouses" that, every now and then, some goofy company still tries to sell. Microsoft's optical mouses are excellent pieces of gear, but they're on the expensive side. The IntelliEye models currently start at $AU79 (for both the plain-vanilla Intellimouse with IntelliEye, and the much more stylish IntelliMouse Optical), but you'll pay $AU90 for an IntelliMouse Explorer. 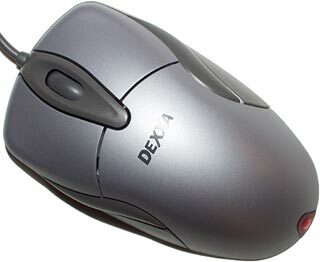 The Dexxa Optical Wheel Mouse, on the other hand, costs only $AU49. The difference might not be much compared with the price of a lot of computer peripherals, but it's still a good 40% cheaper than the IntelliMouse Optical. But is it as good, or is it just a cheap knock-off? Logitech make good mouses, and the Dexxa brand mouses are different, but they're just as well made. I still don't recommend anybody buy a mouse sight unseen - different hand sizes and mousing styles mean that one person's ideal pointing device is another person's fiendish instrument of torture - but there's nothing wrong with the build quality or componentry of any Logitech/Dexxa product I've played with. Show-off style-hounds ought to like the Dexxa. It's got the see-through red base. And it glows real good. Like the Microsoft mouses, the Dexxa dims its alarmingly bright LED illuminator after about a second when it detects no movement. This means that lifting it off the desk and flashing your workmates is tricky to do; in its dimmed mode, it's hardly annoying at all. 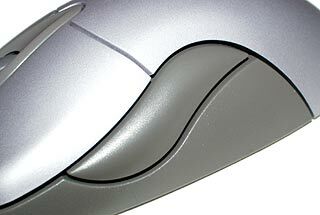 The Optical Wheel Mouse doesn't cut any important corners compared with the Microsoft products. The Microsoft mouses are dual-mode USB and PS/2 devices, with an adaptor plug you use if you want PS/2; the Dexxa's PS/2 only. This is no big deal, unless the ability to hot-swap pointing devices with the computer turned on is really important to you. As with the Microsoft mouses, you don't need to install anything special if you don't want to use the extra two buttons. 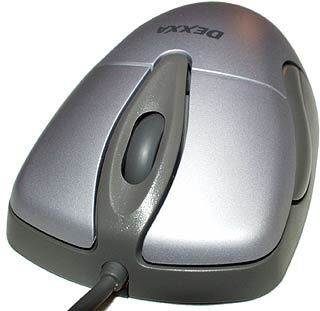 Just plug the Dexxa in and it'll work as a three button wheel-mouse; click the wheel for button 3. On the included floppy disk, though, you get driver software for Windows 3.1, 95/98, NT and 2000. Install it and you can set the side buttons to do a selection of Windows-y tasks, or just emulate keys. I favour Page Up and Page Down; they're somewhat useful by themselves, and you can bind functions to those keys in games, too. If you have trouble with the Dexxa drivers, I've found that Microsoft's IntelliPoint software works perfectly as well. You can get it for free from here. Tell the download form and the IntelliPoint installer, that you've got an Intellimouse Optical, and the buttons will be in the right places in the setup dialog. The Dexxa's side buttons may look nifty, but they're a bit awkward. The lower portion of the buttons seems to sit just where your thumb's likely to grip the mouse, and they bulge out a bit, so when I started using the thing I couldn't keep my clumsy fingers off 'em. You'll be clicking whichever button falls under your thumb all the time until you learn to hold the mouse further back. Once you do that, it's comfortable enough. And it doesn't have the bulk of the Explorer - which isn't as chunky as it looks, but is nonetheless an unusually big mouse - so small-handed people should be fine with it. The wheel doohickey on the Dexxa mouse doesn't have the ridges of the Microsoft models, but it's a high-traction rubber that's just as easy to use, and has a nice positive feel. Like the Microsoft mouses, the Dexxa is no more accurate than a ball mouse. Actually, it's substantially less accurate than over-the-top optomechanical mouses like Razer's Boomslang models (I review the Boomslang 2000 here). But it doesn't matter if your desk's a bit uneven, or your mouse pad's filthy. Over rough surfaces, coffee stains or the train seat next to you, this mouse tracks as well as a clean normal opto-mechanical mouse will on a nice clean mousemat. And it'll do it forever; the feet will gum up over time, but they're easy enough to clean, and there's nothing else to get dirty. Like the IntelliMouse Explorer, the Dexxa hides its case screws under its low-friction feet. Peel off the feet and it's easy to get inside. Interestingly, the main optical pickup chip in the Dexxa seems to be pretty much the same as the one used in the Microsoft optical mouses. The rest of the layout is straightforward enough, with good quality microswitches for the buttons. The Microsoft mouses have a lower component count, but this isn't likely to make any difference to the reliability of the Dexxa. If you use your mouse a lot, it's nice to have one that won't get dirty, and it's even nicer to get it cheap. But you shouldn't buy a mouse you've never used. 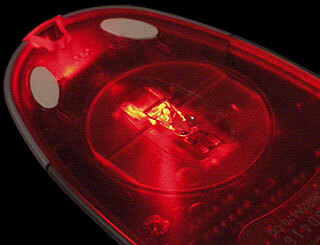 The prominent side buttons on the Optical Wheel Mouse could well annoy you. If I were going to buy one of these glowy-mouses as a gift for someone, it'd be the IntelliMouse Optical, because of its one-size-fits-all design and lovely styling. 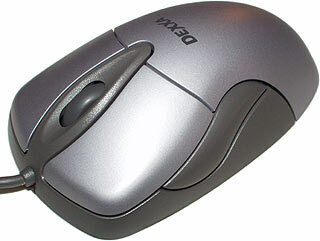 But the Dexxa mouse works just as well and costs substantially less; if its ergonomics suit you, you'll love it. 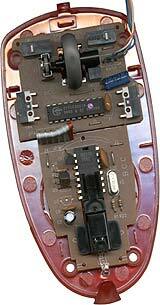 You can sorta-kinda hot-swap PS/2 mouses, but you're not meant to. If you start a Windows PC with no mouse connected, just plugging in a PS/2 mouse won't give you pointer control until you restart the machine. But if you were running with a PS/2 mouse and you unplug it with the computer on and plug in a new one, the new one'll work. Well, it'll probably work. I know I've done it plenty of times and never had a problem. But it's also possible that you'll pop a motherboard fuse, which may or may not be economically replaceable. Your mouse is likely to be fine. The rest of your computer may need major surgery. Incidentally, if you've got a situation where you do need to connect PS/2 devices to running computers - say, rack-mount servers - and you don't want to rig up a big keyboard/mouse switching system, try the "Guardian" line of products from Raritan. They've got gizmoes that emulate a PS/2 keyboard and mouse - they just make the computer think those devices are connected, so machines that would otherwise give no-keyboard errors will start up properly. And the emulators also provide properly hot-pluggable PS/2 connectors, so you don't need to shut down machines to safely connect input devices.